New Kate Designed T-Shirt at Teespring! There is a new t-shirt design at Teespring! It is Kate’s artwork. 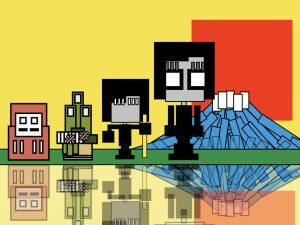 This is an older one that she drew digitally on her iPad. 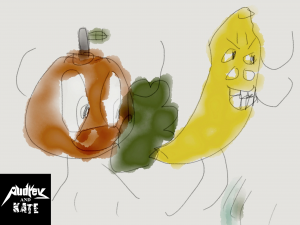 It is a banana farting on an apple. Only from the mind of Kate! Check it out! Catch Our Live Streams on YouTube! We are streaming live on youtube! Just wanted to let you guys know that we have started to do some live streaming on YouTube! Audrey works on her artwork, makes new songs with Kate, and the two have even done a couple of shows playing Rocksmith! Check out our twitter for updates of when we will be live. We do want to make a schedule but for now Kate is on Spring Vacation and so we will do some things at random times! Just a reminder that we do a live stream on Twitch two times a week. Both shows are listed at Tokyo time. If you are checking us out on Twitch then make sure to join us on Discord too! Buy Audrey and Kate Artwork! If you have seen Audrey and Kate’s drawings on YouTube, then maybe you thought you would like to buy one of those artworks? Well now you can! We have an Etsy store open now and you can check there for when we will post more artwork. We will send out tweets to let people know when the next batch is up for sale! Thank you so much for all the support so far! Audrey and Kate wish you all a very Happy New Year and lots of wishes for a great 2019! They made a special song for the occassion! Audrey and Kate Cover Sabotage! 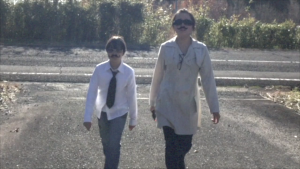 Audrey and Kate had lots of fun making this cover of the Beastie Boys – Sabotage! Even mom and dad are in it! 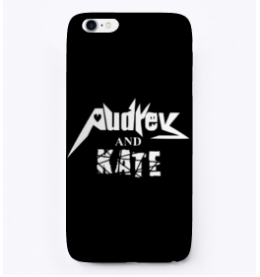 Audrey and Kate Cell Phone Cases now available! Our Teespring store now has more official merch! Get the official logo on cell phone cases! Our subscriber numbers are growing! Our subscriber count has passed 140,000! Also over 21 million views! Wow! Thank you guys so much for watching and all the support! 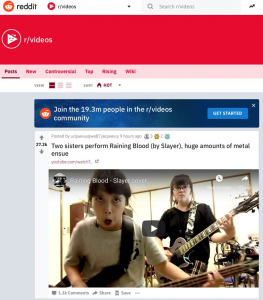 Raining Blood = 1 million views! Our Raining Blood video just passed the 1 million views mark! Thank you all so much for the support!